This is effectively Sylvain Rouviere and a large cast of guests. It starts off in an epic style and threatens to be a very big sound and then continues with varying degrees of success. Rouviere has composed some decent songs and musically they are generally fine. It is his own vocals that don’t always make the grade and the lyrics do feel a little squeezed into tight spaces on some songs. Perhaps it is the presence of guests that place him in the shadows? His guitar skills are clear and in the general style of Vai and Malmsteen so there are plenty of over the top flourishes that some will find irritating rather than enjoyable, others will love them. They are mostly appropriate for the relevant song’s style. This kind of mixed content is typical of the whole piece until the very end and a cover of “Bohemian Rhapsody” that is beyond awful. Opener “Farewell” is a good driving track with power metal pretensions. 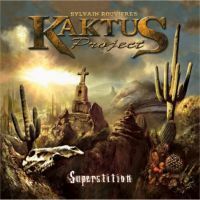 “Superstition” chucks in some intriguing keyboard back drops for a straighter hard rock sound before a kicking chorus section that reminds me of Instanzia who I believe share this label. As the songs continue it all sounds a little haphazard and where some artists seem to produce a whole album that sounds the same, this piece has a little of a lot of different things so it feels like a compilation rather than the album of one band. I’ve been left a little confused by it all but there is certainly enough to come back to apart from the cover version. It is a sour finish to a generally good album, however disparate its parts, and adds nothing.